Any idea? I am looking to sell mine off but do not have an idea on where I should start the price. at least the same price as a 5 gallon keg in similar condition. whatever that is. Sure, but I expect a bit higher since they are rarer. I was thinking $50/keg. I think you could go slightly higher if they are in good shape (which I'm guessing they are). Adventures in homebrewing is selling brand new ball locks for $75+ shipping. your rate sounds good. Edited by LeftyMPfrmDE, 08 February 2019 - 12:37 PM. I saw that too and figured it into my number. I will go down to 45 and after that I will just hang on to them for some time. I do not really use them anymore. 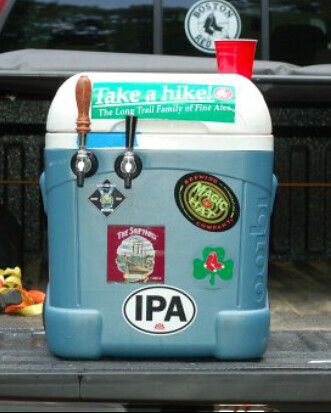 I had them for when I would take a keg to a party and used this cooler. Now I will just take cans. That's cool looking, it holds 2 kegs? Co2? Yes, 2 kegs a paintball tank of co2 and room for a bottle of bourbon for good measure. Nice, that's awesome! I would love something like that for camping trips. You can have this one, come up and grab it. Looks like we have a buyer!! even with that redsox sticker on there? Canning is good. I still am working through some learning curves and most of that falls under fill amount and foaming. I have had a couple leaking seams that I think is operator error and I will be checking the first and second seam with the gauge that came with the canner this week. I did 8 4 packs ( 3 different beets) yesterday in about 45 minutes. Slow filling was the major hang up. Wow, you're canning beets now? Damn. Beet hazy IPA with lactose and cardamom... You should try it!